the novice who has never travelled before doesn't know what he or she doesn't know - but needs to! those who have travelled with their paints before are trying hard to remember what went wrong last time! while the experienced artist and seasoned traveller is very often trying to find a way of rationalising or improving upon what they did last time - for the nth time! This summer I had to get to grips with travelling with oil paints for the first time and I want to record what I learned before I forget it! Plus share what others have learned for everybody's benefit. This week I'm attempting a bit of a round-up of top tips for different types of artists through a mini-series of blog posts. I'm going to make each of them an interactive post - meaning that as top tips and blog posts get identified and highlighted within the comments I'm going to add them into the body of the post and then republish it. This means each post will also up date over time. You might want to bookmark the one which means most to you! To make it coherent I'm going to introduce a structure from the beginning which will help people find out what they want to know. When security asks, "What kind of paints are these?" Never say "oil paints"; say that "these artists paints are made from vegetable oil and contain no solvent." For air travel, flammable liquids are those that have a flash point 140 degrees F. or below. If you do not know the flash point of your mediums or solvent, do not take any on board. Linseed oil based colours are NOT considered “Dangerous Goods” as classified in the International Air Transport Association’s (IATA) Dangerous Goods Regulations. They are not flammable (as described in Class 3 or Class 4 criteria), poisonous or corrosive, nor do they fall within any other class description of “Dangerous Goods”. A UN number does not apply to these materials because such numbers are assigned only to “Dangerous Goods” by the United Nations Committee of Experts on the Transport of Dangerous Goods. Gamblin says that Gamsol has a flash point of 146 degrees fahrenheit. (Gamblin) Officials may feel this is very close to the limit. I wouldn't chance it. Unfortunately many MSDS do not provide accurate classification for transport purposes. You should further inquire with the manufacturer or distributor or have the product tested by an authorized laboratory. Beware that checked baggage as well as hand luggage can be searched. Artists have arrived at their destination to find that their baggage has been inspected! Identify the correct word for your solvent or turpentine before you leave home! storing oil colors in hot cars and trunks will increase the stress on the paints and can cause more oil to separate from the pigment. 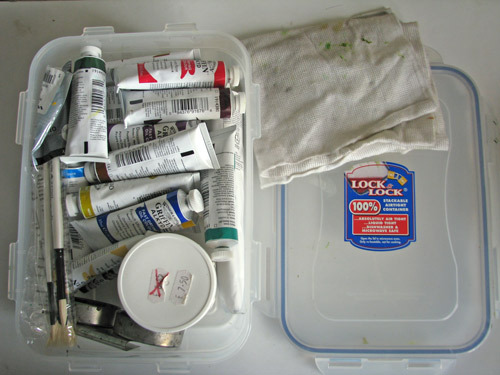 Keep your paints as cool as possible to reduce separation. Remember that drying times vary depending on local temperatures and humidity. Remember to factor that in to your expectations as to drying time. You'll only really find out how long it takes when you get there. Gamblin - I travel frequently. Can I take my oil colors through airline security? Part 4, Making a Lap Box - brilliant "how to" explanation! How do you travel with your paints? Katherine - you are brilliant! What a resource and oh what a pity it was posted this week, just after my return from Turkey where I hadn't dared pack my paints in fear of having them confiscated. Oh well, next year :) Also, you were my first alert to the troubles at home - who needs newspapers when we have Katherine! Lots of great advice and top tips - thank you for sharing. 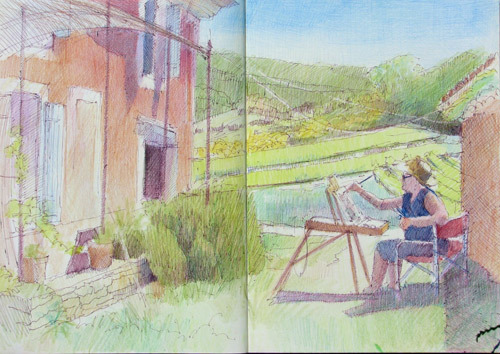 I'm looking forward to the post on watercolour and coloured pencils; I'm continually changing my sketching kit! I wouldn't necessarily agree with working to a uniform size of painting - as I prefer to relate the size and proportions to the subject. 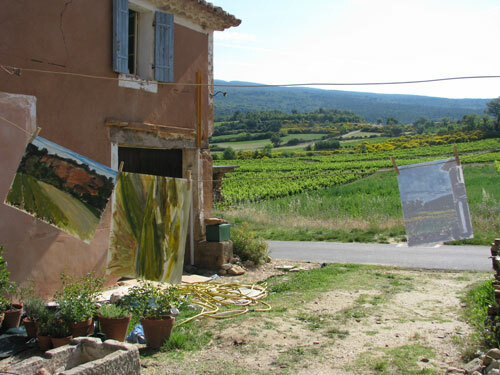 Working plein air and travelling I would normally work on oil or acrylic paper - so works would be sized on the paper according to the needs of the painting and then cropped at home - resulting in the same uniformity and ease for travel, but more freedom of composition in working. Often I work square or near square - also long thin formats and they are essential to the composition I want. I tend not to like the standard proportions of A3 etc. I'm just starting with oil painting and traveling across country by car. Trying to figure out best way to transport wet canvasses in car or rv. Thanks for advice!